We got a bunch of emails asking about the spotting scope we used on our New Year’s Day Snowy Owls outing on Plum Island. Readers searching for a write-up on the scope on RainyDayMagazine came up empty because we had NOT done a review of the unit prior to taking it out into the field. 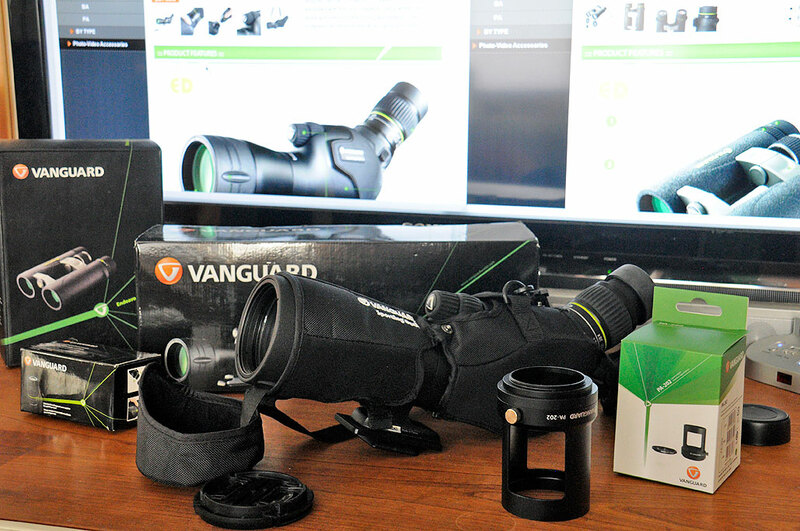 Today, we will remedy the situation by providing a FirstLook on Vanguard Endeavor HD65A Spotting Scope. Compact and powerful, spotting scopes let users locate targets at extreme distances that may be difficult to see clearly with binoculars. The Vanguard Endeavor HD65A spotting scope is a compact telescope designed for situations where magnifications beyond those of typical binoculars are desired. Endeavor 65A comes with a 65mm objective lens and angled eyepiece with 15-45x zoom magnification. Extra low-dispersion (ED) glass is used for the optics to ensure accurate color rendition and minimize color fringing. A built-in sunshield eliminates glare when in direct sunlight. Included are a padded sleeve/covers and a sling for extra protection and ease of transport. The body of the scope is made of magnesium alloy and is rubber armored. The magnesium alloy is both lightweight and rugged. The rubber coating is slip-resistant, tough to scratch, and easy to clean. 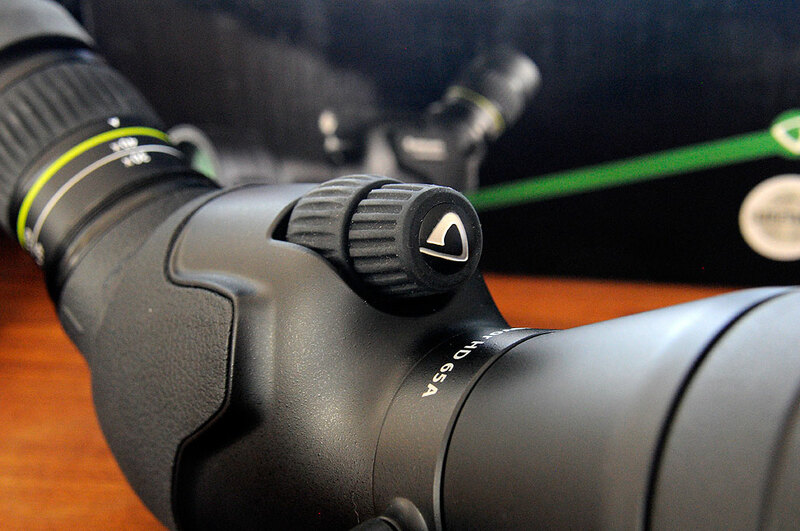 Angled eyepiece allows a shorter tripod than straight eyepieces and is easier to use for looking at things in trees. The extendable, rubber-covered eyecup boasts impressive eye relief even at the highest zoom settings. It also provides a very impressive field of view. The extra-large eyepiece gives a larger field of view and lessens user fatigue. 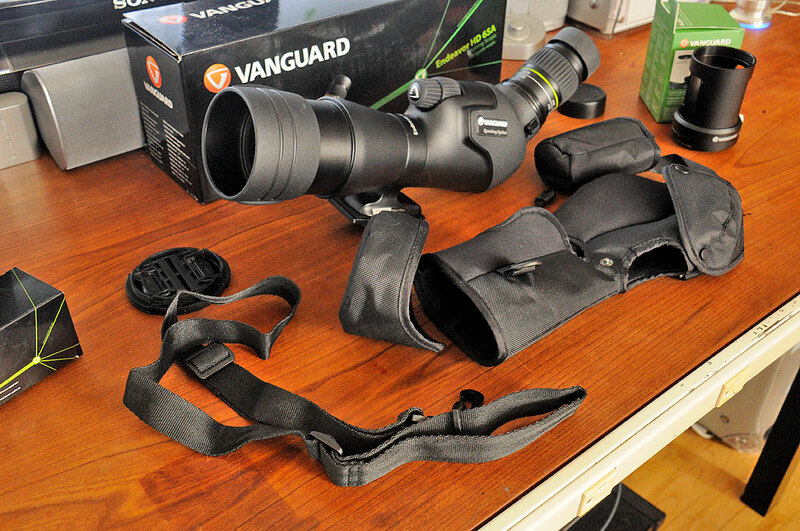 The eyepiece may be separated from the body, which makes the scope more compact to pack and store. Also, this makes it possible for future eyepiece upgrades. The internal optics of both the body and the eyepiece are charged with nitrogen gas to prevent fog formation. Nitrogen-purged components are waterproof, and the process prevents the development of fungus/mold that can form in moist, enclosed environments. With the eyepiece properly secured, the entire unit is sealed against moisture and will float if accidentally dropped into water. This kind of rugged reliability is typically only found in much more expensive scopes. 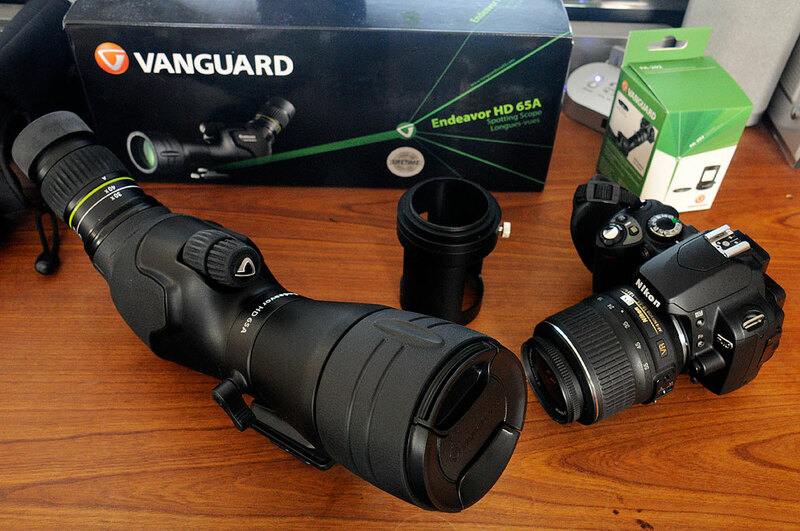 We think the Vanguard Endeavor may be the best value for the money scope on the market to date. Endeavor HD is equipped with rubber-coated fine and coarse focusing knobs. Two separate controls allow for faster and more precise tuning than scopes with just a single knob. We can say from experience that even with gloves on and the wind howling, you can bring things into focus quickly. To make viewing more comfortable, the orientation of the scope may be adjusted for a variety of viewing angles. Very nice. A spotting scope, because of the larger magnification, works better when mounted on a tripod for stability. The scope’s tripod mounting plate is attached to a bracket around the middle of the body. The plate will slide directly to any Arca-Swiss style 38mm tripod head. Shown here is the scope with the quick-mount plate of the ABEO 243CV tripod attached. We will be bringing the Endeavor HD65A, along with some other gear, to the Merrimack River Eagle Festival in February. Before that outing, we hope to test out the digiscoping capabilities of this spotting scope. What is digiscoping? Come back on Monday and find out!